Blogged about before, still in service (no dirt streaks or coffee spills so far), it’s the original, the very first Last One sign (I’m pretty sure it is), brilliant sales tool (nearly 100% successful! ), now part of the Almost Gone collection, Last 1-2-3-4-5 and Not Many Left. This one is on some near-perfect unheated greenhouse spinach. 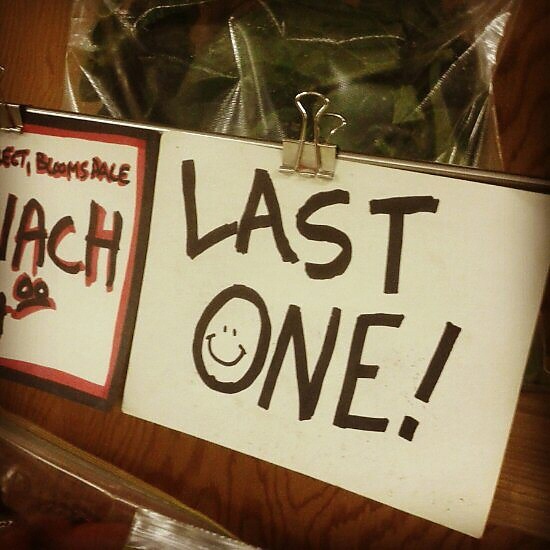 Fun with signage at the winter farmers’ market.